Arriving at the third film in this series set around a Chicago barbers (or fourth, if you count the Queen Latifah-starring spin-off Beauty Shop) and it’s been 12 years since we last caught up with Ice Cube’s scissor-man, Calvin Palmer. Not that you’d know it. 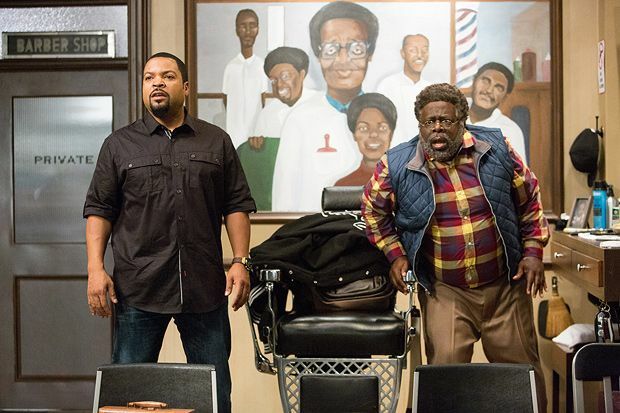 Barbershop: A Fresh Cut springs back into action with its surprisingly crisp mix of sassy back-chat and social issues, as we learn that gun crime and gang violence are on the up in Calvin’s hood. With Calvin’s shop now sharing floor space with a salon, the battle of the sexes is alive and well. Amongst the women working there is Nicki Minaj’s flirty Draya, who has most of the men drooling – including Calvin’s married colleague Rashad (Common), much to the chagrin of his jealousy prone wife Terri (Eve). The scenarios painted are hardly original (not least when Rashad and Draya get caught in the stock cupboard) but they are amusingly played out nonetheless, and Minaj makes for a vivacious presence. Directed by Malcolm D Lee (cousin to Spike), and bringing back old faves like Cedric the Entertainer’s loudmouth Eddie, the film takes a serious turn when a young patron is shot dead on the streets and Calvin and co decide to offer 48 hours of free haircuts to encourage a ceasefire. Gun violence in America is anything but a laughing matter, and A Fresh Cut doesn’t treat it as such. If there’s a slight overreliance on celeb cameos and social media posturing, the only real imbalance comes with a subplot that sees Calvin’s son Jalen (Michael Rainey Jr) about to earn his gang stripes, which tips the film dangerously towards melodrama. But even then, Ice Cube – an actor rarely given credit for his well-honed performances – keeps it afloat. That said, the ultra-naff Obama post-credits sting is something we could have done without. Selected release from Fri 17 Jun. Calvin (Ice Cube) still runs his barbershop but now has to share floor space with a beauty salon. Then a young patron is shot dead. Crisp mix of sassy back-chat and social issues, sometimes veering towards melodrama but good-hearted and amusing; Ice Cube himself keeps it afloat.